Environmental design specialist Terri Preece visits BUDI! In May 2016 environmental design specialist, Terri Preece, from Richard Fleming’s group at the University of Wollongong, Australia, came to visit BUDI and the Wayfinding Lab, following on from a conversation made with PhD Student Mary O’Malley during her Poster session at the ADI 2016 conference. Terri, who consults care-homes and hospitals on how they can be more user friendly for people with dementia was particularly interested in the work BUDI does surrounding designing environments to support orientation, including our eye-tracking (see picture below). 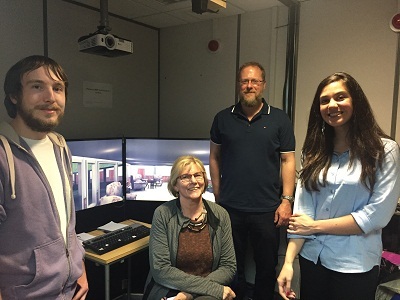 PhD student Chris Hilton showed Terri a demo of his virtual reality eye-tracking study which looks at what aspects of the environment people attend to when learning routes, whilst Mary O’Malley showed Terri her study which investigates how older adults interpret “you-are-here” maps.